The Sanctuary of the Blessed Virgin of the Rosary presents rich baroque interiors embellished with late-manierist elements within an outer casing of the twentieth century. The current building was built between 1622 and 1644. The history of the site is however much older. The first mention of a Church of Santa Maria in this position dates back as far as 1063. This first version of the church included a single nave, long about half of the current one and more or less in the middle of the current building. In 1272 the second version of the church was consecrated. In Romanesque style, wider and equipped with three naves, it corresponded more or less to the three aisles of the current church. Some pillars were in fact retained, still recognizable today, as well as the remains of the baptistery at the beginning of the left aisle. Already at the end of the sixteenth century this second church was in a bad state, so it was decided to replace it with a new building, the current one. The construction of the new church saw the intervention of the major architects active in Milan in the seventeenth century: Fabio Mangone and Francesco Maria Richino. In 1688 the high bell tower was demolished and replaced by a new one completed in 1700. The five bells currently present were however put in place only in 1776. Francesco Croce built an octagonal sacristy in 1770-73, unfortunately demolished at the beginning of the twentieth century. In fact, at the beginning of the twentieth century, at the suggestion of the Cardinal of Milan Ferrari, who considered the capacity of the church insufficient, it was decided to expand it. This happened through the addition of the transept and the modification of the apse in order to allow to move the altar further backwards and get more space in the main nave. At the end of the twentieth century the church enjoyed important restoration work. The exterior of the church is rather complex, probably as a result of the additions and the enlargements over the centuries. There are thereforse, all different, the width of the façade, then the width of the main body including the three naves, that of the transept, which, in turn, has the central part that on each side protrudes a little. And then there is the width of the large apse. The latter is flanked on both sides by two lower and narrower volumes that are located where the side apses would be, but which are not apses, since, inside, they do not make a single body with the side aisles. The back of the church appears as a second façade, with, in the upper part of the central body, two niches with the statues of Saint Francis of Assisi and St. Catherine of Siena, placed there only in 1941. The main façade is definitely better than the back one. It is characterized by monochromatic graffiti decorations, typical of the early twentieth century. Doors and windows are enriched with frames and pediments. On top a large triangular protruding pediment. It is so deep that in the aerial photos it can be noted that it is covered above with a real tile roof. The two large statues of angels at the left and right top upper corners give a Renaissance touch to the church. They were sculpted by Egidio Caldana of Vicenza and were placed in place in 1928. The interior of the church comprehends three naves, separated by rectangular-section pillars. On the sides that look towards the central nave and towards the transept the pillar goes up to the ceiling, with which it is connected by a Corinthian capital. On the other sides a cornice in a lower position delimits the conjunction with the arch. All sides have fake marble decorations within stucco frames. The church has a lunette barrel roof which is separated from the vertical parts by a thick trabeation. The ceilings are decorated with fake stuccos in correspondence with the junction lines between the various surfaces. Around the windows placed in the lunettes there are also vegetal decoration elements and, in the central nave, a putto on each side of every window. In the windows of the back walls of the transept arms the windows are flanked by figures of prophets. At the cross between the transept and the central nave there is an ellipsoidal dome (Fig. 3) which houses a large fresco of the Assumption of Mary. The Virgin is depicted ascending to heaven accompanied by a angels and with a halo of cherub heads. On the edge a trompe l'oeil balustrade to suggest that the dome is open on the sky. The four evangelists are represented on the spandrels. These decorations (as also the great scenes with episodes from the bible painted on the the back walls of the transcept arms) are all of the early twentieth century and determine the general imprint of the church. Two are the most important chapels. Chapel of the Savior (Large Figure): It is the first chapel on the left. Its interior surfaces are completely decorated with stuccoworks, frescoes and paintings dedicated to the theme of sacrifice and made between 1647 and 1650. The late-manierist style stuccowork is by Michel Angelo de Prevosti, while frescoes and canvases were painted by Nuvolone and his wotrkshop. The entire decorative apparatus is developed around the fresco in the center, from 1514, depicting the Savior, originally placed in the counter-façade and currently hosted by a rich polychrome marble retable. It represents Christ with the crown of thorns on his head showing the wound on his side. The background is represented by an architecture with strong perspective effect. On the sides of the altar there are the prophets Isaiah (left) and Jeremiah (right) surmounted by angels flying in a blue sky. On the vault other angels that hold the emblems of passion: the ladder, the cross, the column. Other angels on the inferior side of the entrance arch show the instruments of passion. On the side walls there are four paintings by Carlo Francesco Nuvolone, inside stucco frames, the main figure of the workshop: The Sacrifice of Isaac (the most precious one), Giuseppe sold by the brothers, Jonah thrown up by the whale and The erection of the bronze snake. Noteworthy also the scagliola altar. Chapel of Santa Caterina (Fig. 4): It represents the other chapel of great artistic value of the church and is located right in front of the previous one (ie it is the first on the right). At the center there is the altarpiece, a work of Lattanzio Gambara of 1565, dedicated to the mystic Marriage of Saint Catherine with Saint Joseph and Saint Francis. The canvas is characterized by soft and delicate figures, but at the same time not static, with the lighting of the scene to emphasize these characteristics. The canvas is located inside a rich polychrome marble retable surmounted by a broken ellipse pediment. The walls and the vault are completely occupied by sumptuous baroque stuccoes made in 1672. In the stucco decorations there are small frescoes depicting the cardinal and theological virtues as well as various cherubs. On the side walls, finally, two paintings made in 1673 by Francesco Innocenzo Torriani and in which Santa Lucia and Santa Apollonia are represented. The other chapels are less rich in artistic content. On the left there is a chapel of the Sacred Heart (second chapel left) and one of the Crucifix (third chapel on the left). The third chapel on the right is dedicated to the Magi (Fig. 5). 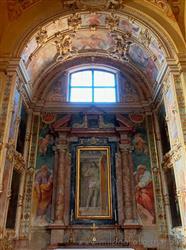 Its decoration resembles in style that of the Chapel of Santa Caterina, though less rich. It contains a seventeenth-century altarpiece and an altar in scagliola (1757) by Lorenzo Retti. On the right wall a canvas with San Carlo. The area of the main entrance is dominated by the large complex of the organ and the cantoria (Fig. 7), integrated in the lines with the underlying entrance in walnut wood. Entrance and choir are in rococo style and were made around 1760. The second is by Giuseppe Missaglia. The organ, however, is no longer the original one, but was replaced with a new one in 1851, built by the Prestinari brothers. The attention of the visitor who accesses the church through the main entrance is however focused on the opposite side, that is on the large high altar in polychrome marble surmounted by the miraculous statue of the Virgin. According to tradition, during a procession to ask for the end of the plague of 1630, the statue came to life, moved an arm and shortly thereafter the plague disappeared. It is a "dressed" statue, consisting only of hands and face and for the rest consisting only of clothes. It was built in 1609 by an unknown sculptor. Currently it is inside a reliquary above the altar. The main altar was built between 1677 and 1686. The scenic temple like architectural structure was designed by Serafino Tencalla; twisted columns of a composite ionic order support the curved and broken tympanum, surmounted by a balustrade with marble flower vases. The tabernacle is crowned by a dome, on which is placed a small oil painting depicting the Coronation of the Virgin, a work of the circle of Giuseppe Nuvolone. On the sides there are two angels in Carrara marble made in 1732. Also worthy of note are the two heads of cherub on the sides of the base and the 1662 cantilevered silver antependium, placed on the side of the base facing the nave and work of the priest Benedetto Millione. Behind the altar there is the eighteenth-century choir in carved walnut wood, including two rows of seats. Each seat of the back row is decorated at the top with a carved wooden shell. In the case of the central seat the shell is accompanied by two putti sitting beside it. On the ceiling of the choir are represented San Sebastiano, Santa Giovanna and San Tarcisio, with among them the dove of the holy spirit. The new sacristy (Fig. 10), built at the beginning of the twentieth century, preserves the original cupboards of 1770 designed by Francesco Croce. In it is also preserved a large painting depicting the scourging, attributed to the Flemish school by some, to Giulio Campi from others. Beautiful, finally, the ellipsoidal carved wood pulpit, painted and gilded, and equipped with canopy (Fig. 6). Search Sanctuary of the Blessed Virgin of the Rosary in the section Photography!